Unusual occurences in the seas surrounding the British Isles. Records of some of the rarer British marine fish were received this year. Peter Glanvill reports a further observation of the Black-faced Blenny, Tripterygion atlanticus, from seas off Dorset, in case in shallows of the Fleet Lagoon near Chesil Beach. This species was not found in Britain until 1972 and it was 1975 before it was described as a species different from a similar species Tripterygion tripteronotus found in the Mediterranean. It is not a true blenny and belongs to the family Tripterygiidae. Fish of this family are small and inhabit rock crevices below low water mark in much the same way as many of blennies do. However, they have three dorsal fins and scales, whereas true blennies of the family Blenniidae have a single dorsal fin running the length of its body and have a mucus covered skin. Exactly how common, or how rare, the British Black-faced Blenny is can only be ascertained by divers' reports. They may have to be searched for because they are secretive. They are also highly territorial and will stay in an area of about 3 square metres. Wheeler reports the British species growing to a length of 68 mm. Two pairs have been seen in the Fleet along with Corkwing and Ballan Wrasse and Tompot Blennies. Postscript (1998): the scientific name for both species is now Tripterygion delaisi. This fish (Helicolenus dactylopterus) was first reported in the Aquarist & Pondkeeper by Dr David Ford in January 1996 and in the Winter 1995 issue of Glaucus (06.03.06). The specimens were caught in the Thames estuary and put on display at Southend-on-Sea Sea Life Centre. In deep water where it is normally found it is probably common, but we are always pleased to hear further reports. Graham Pickett (MAFF) reports a single specimen was caught in the cold water intake screen at Tilbury Power Station in early February this year, 1996. It did not survive alive, but the Environment Agency (formerly the NRA) have preserved the fish. It seems that there is a population of this fish in the southern North Sea. This species can be seen alive at the new Irish National Aquarium in Dingle, Co Kerry where a number of deep-water species are being kept. October 1997. A Bluemouth Rockfish, Helicolenus dactylopterus, was caught off Guernsey. The World Record Bluemouth Rockfish, Helicolenus dactylopterus, was caught by Fredrik Meyer (Sweden) outside Trondheim from the island Hitra, off the Norwegian coast. It weighed 1495 grams. The Bluemouth is rather common in deep Norwegian waters. In the south of Norway, outside Langesund there has been several catches. English. Blå=blue, kjeft/käft=jaw, exactly bluejaw. 15 July 1997. 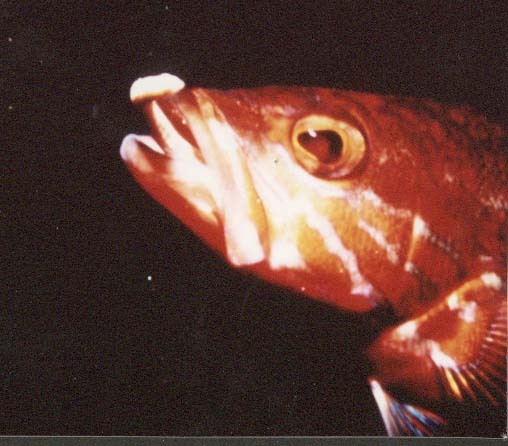 A Bluemouth Rockfish, Helicolenus dactylopterus, was caught by a bean trawler 8-10 miles west of Guernsey. (Richard Lord Report). The species found in British seas during the summer months and autumn is Balistes capriscus (=B. carolinensis). This is a new specific name for this fish. Graham Pickett (MAFF) reports the incidental capture of a specimen in Southampton water in a routine beam trawl in late September 1992. It was about 40 cm long. A further two were captured in the trawl in the east Solent, south of Hayling Island. The latter are authenticated reports east of the Isle of Wight. In 1992, fishermen reported catches of this fish off Sussex in large numbers, instead of the odd one, for the first time. Chris Clark has caught Triggerfish on many occasions on rod and line. All captured specimens are returned which is certainly becoming the practice amongst sport anglers. Chris reports that the fish fight hard and are very hardy and returns are likely to have a 90% survival rate. There are several mysteries surrounding the behaviour and occurrence of this fish in British seas. Chris, who as an angling writer, has many contacts around these islands and lives in Hampshire, assures me that Triggerfish congregate before returning west to warmer waters in late September. The second puzzle is their path of arrival. Peter Glanvill, in the article in the Winter 1995 issue of Glaucus, thought that the fish followed the northern English Channel coast eastwards and settled around wrecks and rocky outcrops. Records from Cornwall are always earlier in the year. There are very few records from the Brittany coast but there are not many areas where the fish can be caught by anglers from the shore in France. As this spring has been cold it will interesting to hear of the first reports of Triggerfish caught this year. A new and unusual fish was captured in a crab pot off Mevagissey towards the end of June in 1996. Hugh Bowles, Harbourmaster, and spokesman for the Mevagissey Aquarium in which the new fish has found a home hopes that the fish will survive the trauma of capture and become a feature of the Public Aquarium on the harbour at the small fishing community on the south coast of Cornwall. The harbour is sheltered from the west coast storms and faces east across the bay. The nearest large town is St. Austell. As it is in the far south-west, the seas off this part of the coast are some of the richest off the English coast and often contain species normally found much further south. This is true of the Comber, Serranus cabrilla, which is a member of the Bass family Serranidae. It is quite common in the Mediterranean Sea but uncommon north of the Bay of Biscay. However, this fish was juvenile which backs up claims of a population breeding in the English Channel. Adults attain a length of 30 cm. It usually lives on or around the sea bed at depths of 20 metres or more. It feeds on smaller fishes, crabs and prawns and anything else available. Identification proved to be a bit of a problem at first. The fish was described as reddish with brownish blotches. It had 11 spiny spines on the first dorsal fin preceding a soft-rayed second dorsal fin. This is effectively reduced the possibilities to two fish, the Comber and the Bluemouth, Helicolenus dactylopterus. Although, colour is often a misleading guide to the identity of the fish. the Bluemouth is distinguished by a blue mouth which is easily noticed on close inspection (this ignores the possibility that fish of this species without a distinctive blue mouth are overlooked or mistaken for another species). However, the Bluemouth belongs to the family Scorpaenidae and these fish are more obviously bottom dwellers with a large eye and a keeled spiny head and very much like the common Bullhead, (sometimes called the Sea Scorpion) Taurulus bubalis, on initial appearance, but with a different dorsal fin arrangement. In 1992, George Hatt of Newlyn caught a 14 oz Comber Serranus cabrilla near the Wolf Rock. A huge Opah, Lampris guttatus, was discovered washed up on Ronaldsay in the Orkneys during 1995. This fish was over 1.5 metres in length, and because it is almost as broad as it is long, this is a very big fish. Dazzling too: it was described as having bright red fins and silver and gold scales. The Opah is the only fish in the family Lampridae. It usually inhabits deep mid-ocean waters at depths of over 100 metres. All its fins are blood red including the long pectoral (side) fins. Specimens of up to 73 kg are rarely captured in fishing gear, with exceptional specimens recorded to 250 kg. It is a predatory fish of this little explored ocean region where it feeds on hake, blue whiting and squids. A rare sea fish which has only been landed in Britain four or five times in the last 20 years has recently been preserved by the Truro self taught taxidermist Kenny Everett which took him three weeks to complete. The fish was a Louvar which bear some resemblance to the members of the tunny family but is placed in a family of it’s own the Luvaridae It was caught off Newlyn in August, bought by Smart’s the fish merchant of Newlyn who commissioned the work by Mr.Everett and will now form part of Smart’s growing collection of strange and rare fish. The Louvar was 4ft long but can grow to 6ft or more . It is a most striking fish, deep bodied, with a high almost vertical profile and a brilliant pale pink lower body and deep blue above. The fins are scarlet except that the tail fin is deep blue with reddish tinges. The adult is totally different from the young fish which goes through several characteristic stages of development and this has led to several of these stages being recognised at some time as distinct species, or even genera, of fishes.. Only adults have occurred in northern European waters although it has a world wide distribution in warm temperate seas but not reported on tropical waters on either side of the equator. They have a toothless small mouth and feed on jellyfish and the like. It is known to breed in the Mediterranean where many of the highly variable young stages have been captured, but many details of its life history are yet unknown. I received an e-mail from Andy Horton about your request for information on the Luvar landed at Newlyn. This is as much as I know about it. The Luvar was landed in August 1998 and sold at Newlyn Market to Smart's the local Fish Merchant who commissioned Kenny Everett a taxidermist of Truro to preserve and stuff it. I understand that Smarts have a display of unusual fish at their establishment and this one was due to join them. News. Also 15 kg specimen landed Newlyn 20.8.1999, caught by FV Excellence while fishing for tuna 70 miles SW of Ireland. Angler Val Fletcher struggled for 40 minutes to reel a unique shore capture of the deep oceanic fish known as the Oarfish, or Ribbonfish,Regalecus glesne, off the north-east coast of England at Skinningrove, Cleveland. This rare fish caught on a squid bait came as a bit of a shock, even scary, as first the head and then the whole length of its 3.3 metres emerged from the sea. This elongate silvery fish, with red fins weighed in at 63.5 kg, which actually meant it was rather a small one for arguably the largest, certainly the longest bony fish in the mostly deep oceans (found down to 1000 metres) attaining a normal length of 7 metres and a maximum of over 11 metres, and a maximum weight of 272 kg. So unusual was this discovery that it ranks as perhaps the most unusual of all records on these news pages. Unfortunately, there does not seem to be a photograph of the find. The last record of an Oarfish washed up on the British coasts goes back to 1981, again on a North Sea coast at Whitby, north Yorkshire. There is only one photograph of an Oarfish in the wild, which shows that its main method of swimming is vertical, propelled by its dorsal fin. However, there are records of young fish swimming below the surface in an undulating motion. The Oarfish has a wide distribution in all the deep oceans with most records from the tropics. It is one of two fish in the family Regalecidae. The similar Ribbonfish are in the family Trachipteridae. British Marine Life Study Society, Shorewatch, Glaucus House, 14 Corbyn Crescent, Shoreham-by-Sea, Sussex. BN43 6PQ, United Kingdom.